Linnaeus named this genus in 1753. 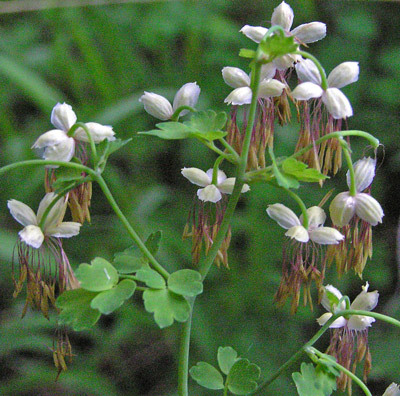 "Thalictrum" is of ancient and unknown Greek origin. Foothills, montane, subalpine. Woodlands, meadows. Spring. Above: Galloping Goose Trail, June 23, 2016 and Lower Stoner Trail, June 29, 2015. Left: Owens basin Trail, June 13, 2004. 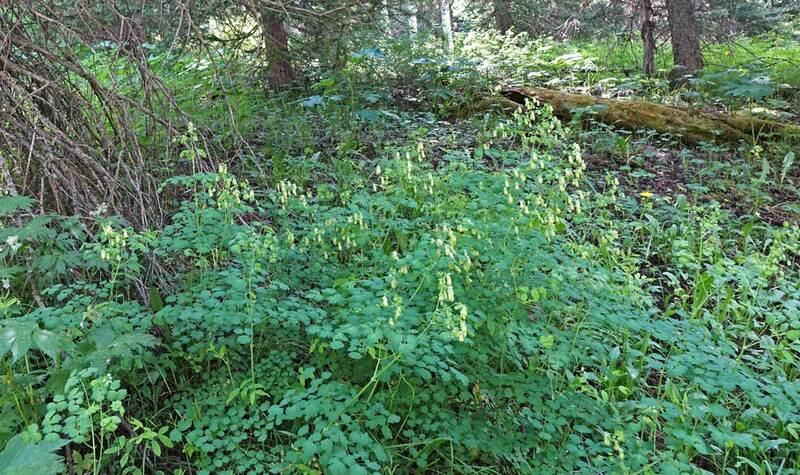 Meadowrue is delicate, very common, and often unnoticed. 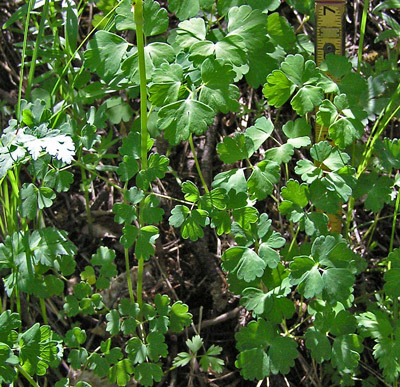 It grows to two or three feet tall and frequently appears in large dappled patches in forests and meadows. 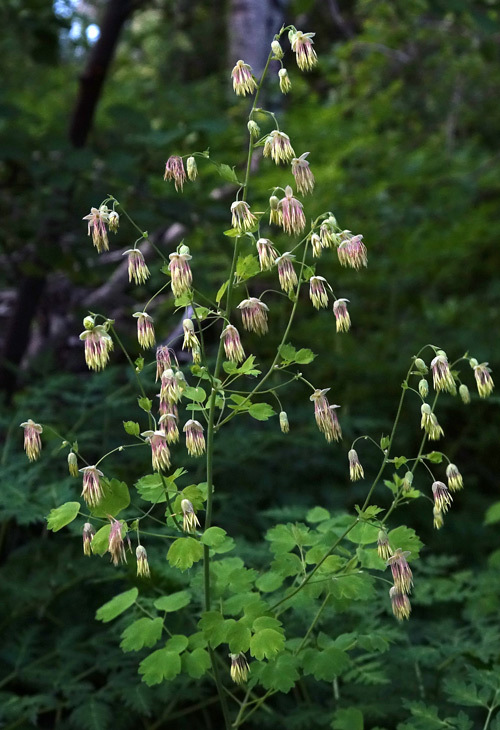 The delicately scalloped leaves of Meadowrue are similar to the leaves of Columbine but are considerably smaller (see below). 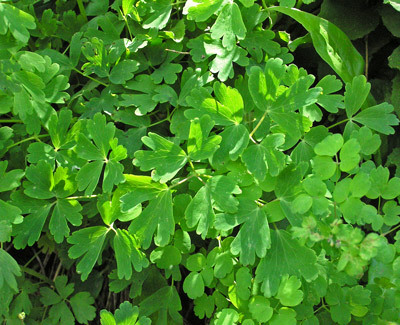 The leaves have a distinct pleasant smell when crushed. 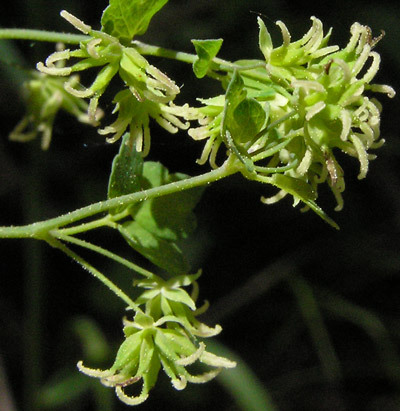 As explained below, Thalictrum fendleri is dioecious and the second and third photographs above show first the male and then the female flowers found on separate plants. Pollen grains from a nearby male plant dot the female plant shown in the photograph immediately above. 1) T. alpinum typically has no stem leaves vs. leafy stems of T. fendleri. 2) T. alpinum has a racemose inflorescence vs. a paniculate inflorescence (branched racemose). 3) T. alpinum has bisexual flowers vs. unisexual flowers. 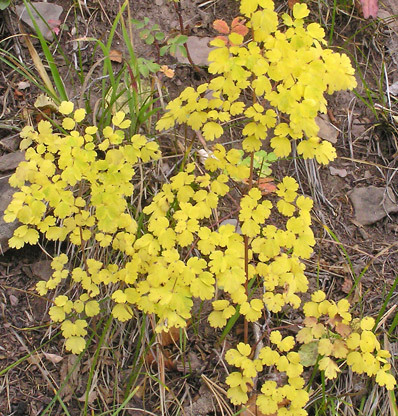 Weber places Thalictrum in Thalictraceae, not Ranunculaceae. Taylor Creek Trail, June 2, 2004. 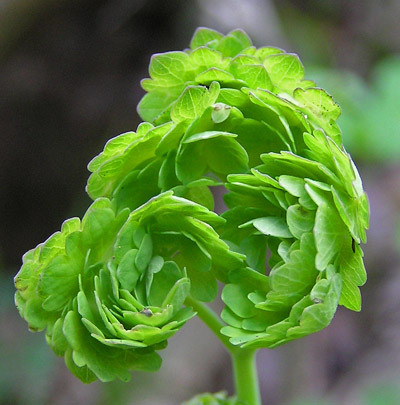 Meadow Rue's leaves delicately unfold in swirls from a small orb. 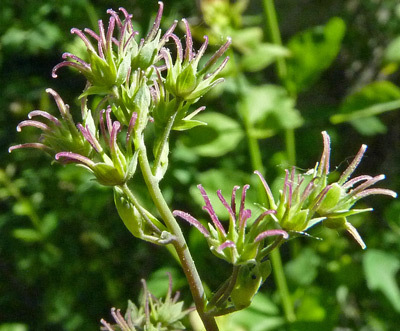 Meadow Rue is dioecious (Greek for "two houses), i.e., Meadow Rue has male flowers separate from female flowers and, in the case of Meadow Rue, they are also on separate plants. 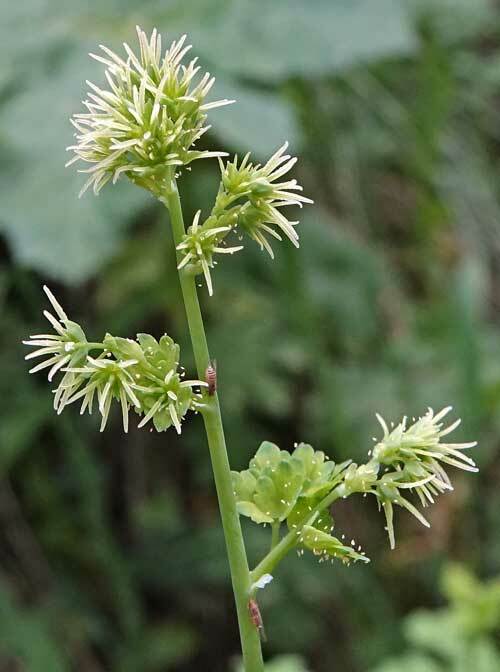 The male flowers lack petals and thus attract little attention, but a close look at the flowers reveals very unusual, attractive tassel-like stamens giving the plant a festive atmosphere. Horse Creek Trail, June 27, 2006. As stamens fade brown, they contrast with the white sepals. Weminuche Wilderness Trail, June 23, 2007, Stoner Mesa Trail, June 18, 2010, and Little Taylor Creek Trail, July 28, 2005. 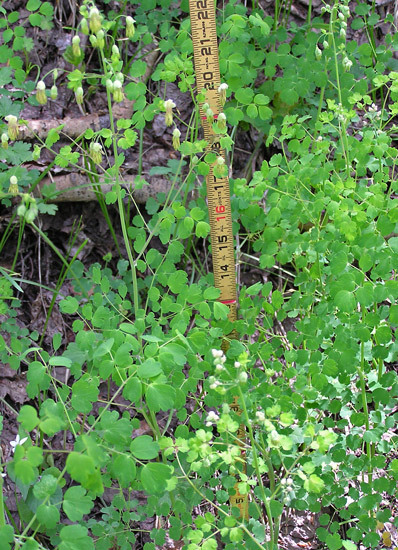 Female plants: Meadowrue styles can have just a tinge of, or considerable, pink. 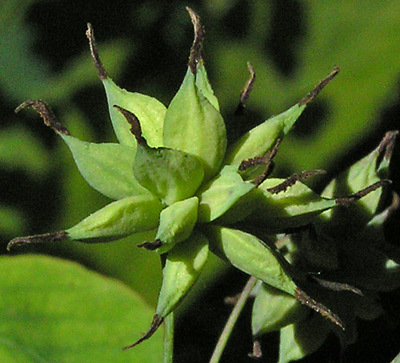 Styles are brown and hardened on the seed pods. Little Taylor Creek Trail, June 16, 2004 and Bridal Veil Falls Trail, July 23, 2009. 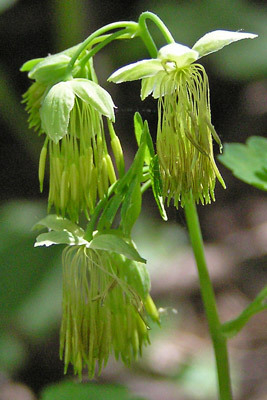 In the top photograph at left, the larger leaves to the right of center are those of Columbine; the smaller leaves at left are those of Meadowrue. They are very similar and fool us often -- as the second photograph at left indicates. Calico Trail, September 30, 2009. 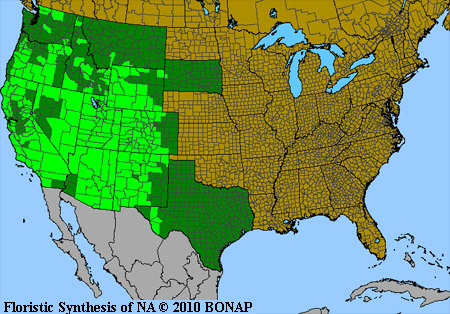 Fall colors are typical of mountain flora: yellow, yellow, yellow.